How to Organize a Large React App and Make It Scale — Jack Franklin describes a set of tips and best practices for creating and organizing React applications in a scalable way. Integrating React with Other Libraries — Includes examples of using React alongside libraries like jQuery and Backbone. 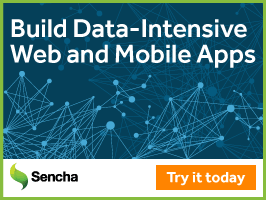 Create data-intensive, feature-rich web and mobile apps with Sencha Ext JS — Learn how to design, develop and test data-intensive web apps that run on desktops, tablets, and smartphones. React-Sketch.app Renders React Components to Sketch Documents — A new library that lets React components render to Sketch (a popular Mac-based design tool) documents. A Cartoon Intro to Fiber from React Conf 2017 — A straightforward ‘from the very basics’ 30 minute explanation of how React’s new ‘Fiber’ core works. Sebastian Markbage Chats About the React Core Team and React Fiber — A 9 minute interview. Using ReactJS, ES6 & JSX to Build a UI (the rise of MERN) — Part 5 of our Modern Application Stack series, Why ReactJS is driving the development of modern applications. Building a Basic Next.js App With MongoDB — Next.js is a framework for building server-rendered React apps. $20 Free Credit on a new account. — Linux cloud hosting starting at 1GB of RAM for $5/mo. Use promo code REACT2017 and get $20 credit. Recycle: A Functional/Reactive Library for React — If you like RxJS and observables, check this out. An 'Infinite Scroll' React Component — Demo here.